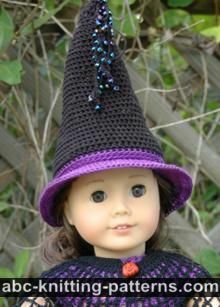 My dolls are dressing as witches for Halloween this year (yes, all of them!) 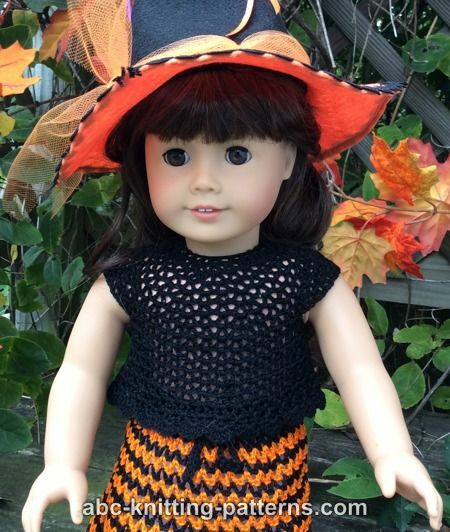 This crochet skirt and top are for the modern witch, who needs to get things done in style, but doesn't have the time to doll up in the traditional robe-and-cobwebs. 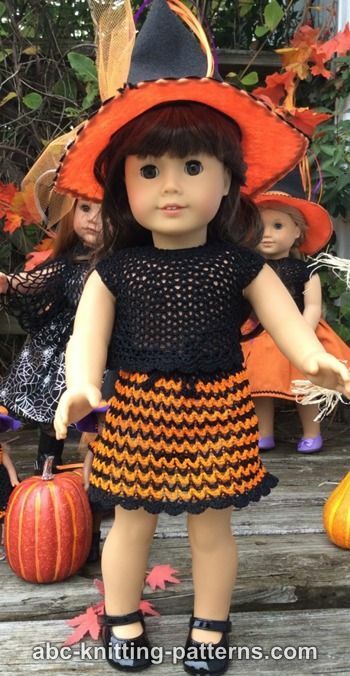 Though I knitted it in orange and black for Halloween, it will work great as a casual skirt and top if you just use different colors. 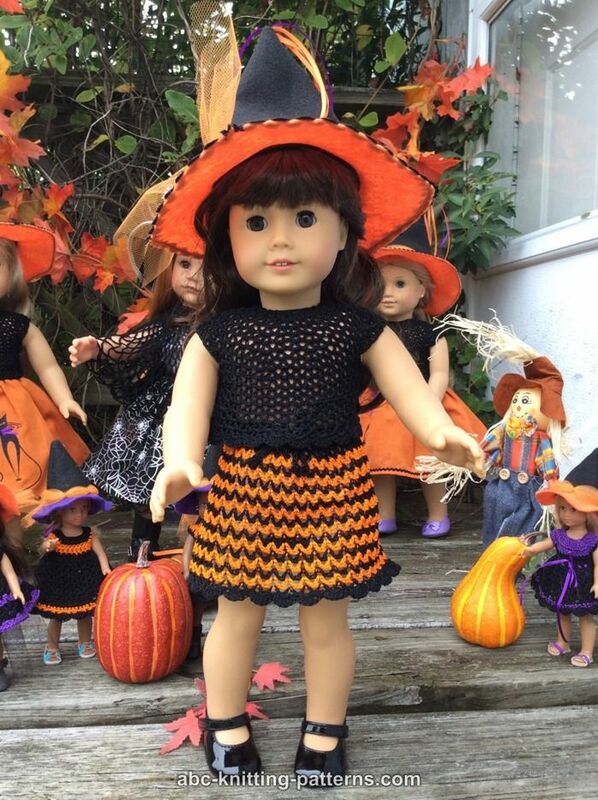 Buy this American Girl Doll on Amazon.com for the best prices and quick shipping! 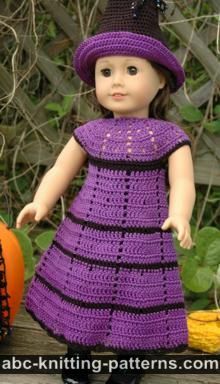 The skirt is worked top-down, in the round, seamlessly. With black thread chain 80, join into round. Round 1: ch 4 (counts as 1 dc and 1 chain), skip the next chain, *dc in the next chain, skip 1 chain, ch 1 - repeat from * across the round. Join with sl st. Round 2: ch 4, dc under ch-1-space, V-st in each ch-1-space across the round. Join with sl st into the third chain of the beginning ch-4-space. 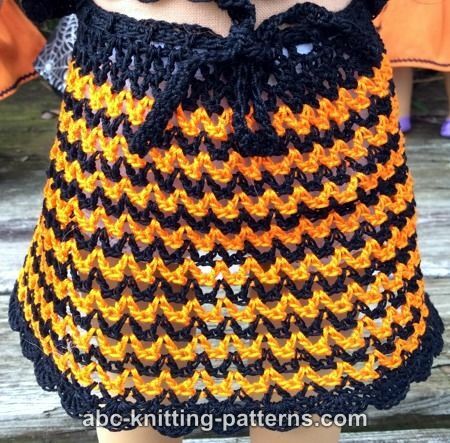 Round 3: Make another slip stitch, so that the hook is in the 4th chain of the ch-4-space. Chain 4, 1 V-st in each V-st across the round. Join with sl. st in the third ch of the ch-4space. Repeat round 3 sixteen more times, or to desired length. Starting with round 4, alternate the thread color every round. Round 20 (last round), working in black: *5 dc in V-st, 1 sc between the neighboring V-st, repeat from * across. Sl st to 1st dc. Chain a string about 18 inches long. Turn and work 1 sc in each chain. Tie off. Cut thread. Weave in ends. Weave in all thread ends. Insert the belt through the eyelets of the first round of the skirt. 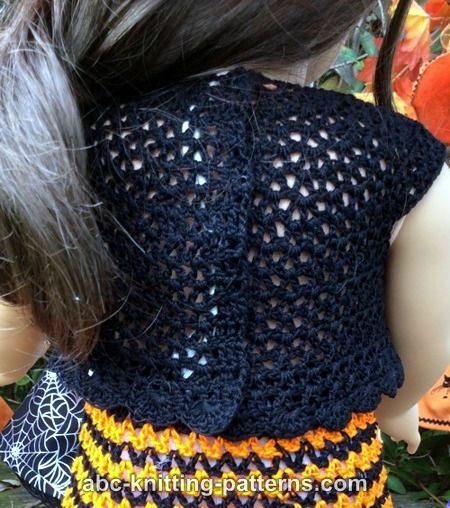 The top is worked top-down in one piece, seamlessly, with round yoke and button band on the back. Row 1: Chain 3 (counts as 1 dc), insert hook in the 5th ch from the hook, 1 dc in each of the next 2 chains, *ch 1, skip the next chain, 1 dc in the next chain, - repeat from * to the last 3 chains, 1 dc in each of the last 3 chains. Turn. Row 2: ch 3 (counts as 1 dc), 1 dc in each of the next 2 dc, V-st in each ch-1-space, 1 dc in each of the last 3 dc. Turn. Row 3: ch 3 (counts as 1 dc), V-st in each of the next 2 V-sts, W-st in the next V-st, *V-st in each of the next 4 V-sts, W-st in the next V-st - repeat from * 4 times, V-st in each of the last 2 V-sts, dc in each of the last 3 dc. Turn. Row 4: ch 3 (counts as 1 dc), 1 dc in each of the next 2 dc, V-st in each V-st and ch-1-space of W-st across the row, 1 dc in each of the last 3 dc. Turn. Row 5: ch 3 (counts as 1 dc), 1 dc in each of the next 2 dc, V-st in the next V-st, *W-st in the next V-st, V-st in each of the next 3 V-sts - repeat from * 3 times, W-st in the next V-st, V-st in each of the next 2 V-sts, *W-st in the next V-st, V-st in each of the next 3 V-sts - repeat from * 3 times, W-st in the next V-st, V-st in the last V-st, 1 dc in each of the last 3 dc. Turn. Row 6: ch 3 (counts as 1 dc), 1 dc in each of the next 2 dc, V-st in each V-st and ch-1-space of W-st across the row, 1 dc in each of the last 3 dc. Turn. Row 7: ch 3 (counts as 1 dc), 1 dc in each of the next 2 dc, V-st in the next V-st, *W-st in the next V-st, V-st in each of the next 3 V-sts - repeat from * 4 times, W-st in the next V-st, V-st in each of the next 2 V-sts, *W-st in the next V-st, V-st in each of the next 3 V-sts - repeat from * 4 times, W-st in the next V-st, V-st in the last V-st, 1 dc in each of the last 3 dc. Turn. Row 8: ch 3 (counts as 1 dc), 1 dc in each of the next 2 dc, V-st and ch-1-space of W-st across the row, 1 dc in each of the last 3 dc. Turn. Row 9: ch 3 (counts as 1 dc), 1 dc in each of the next 2 dc, V-st in each of the next 7 V-sts, chain 7, skip the next 10 V-sts, 1 V-st in each of the next 14 V-sts, chain 7, skip the next 10 V-sts, V-st in each of the next 7 V-sts, 1 dc in each of the last 3 dc. Turn. Row 10: ch 3 (counts as 1 dc), 1 dc in each of the next 2 dc, V-st in each of the next 7 V-sts, over ch-7-space work in the following way: 1 dc in the first chain, ch 1, skip the second chain, 1 dc in the third chain, skip the forth chain, 1 dc in the fifth chain, skip the sixth chain, 1 dc in the seventh chain, V-st in each of the next 14 V-sts, over ch-7-space work as described before, V-st in each of the next 7 V-sts, 1 dc in the each of the last 3 dc. Turn. Row 11: ch 3 (counts as 1 dc), 1 dc in each of the next 2 dc, V-st in each of the next 7 V-sts, V-st in each of the next 3 ch-1-spaces, V-st in each of the next 14 V-sts, V-st in each of the next 3 ch-1-spaces, V-st in each of the next 7 V-sts, 1 dc in each of the last 3 dc. Turn. Row 12: ch 3 (counts as 1 dc), 1 dc in each of the next 2 dc, V-st in each V-st across the row, 1 dc in each of the last 3 dc. Turn. Repeat row 12 five more times. Last row: ch 1, 1 sc in each of the next 3 dc, *5 dc in V-st, sc between the neighboring V-sts - repeat from * across the row to the last 3 dc, 1 sc in each of the last 3 dc. Tie off. Cut thread. Weave in all thread ends. Sew 5 snaps to the button band. 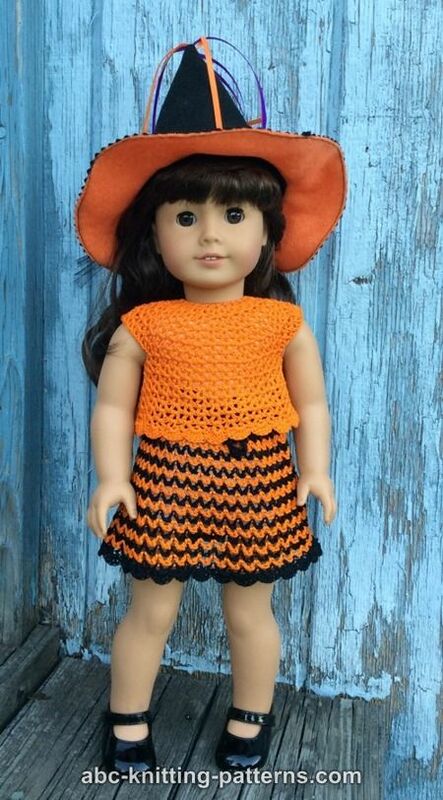 My granddaughter loves your crochet doll patterns, as do I. Thank you for allowing us to share your work! 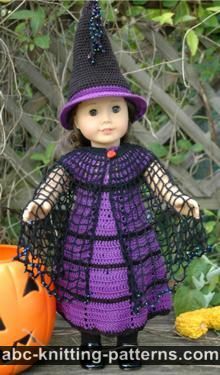 Your patterns took me from decades of yarn crochet to the beauty of small thread crochet. Thanks again for the inspiration!